Brainiac has conquered Warworld and allied himself with Maxima, Supergirl, and Draaga. Superman and some of Earths heroes take the battle to him and invade Warworld, while others fight Warworlds invaders on Earth. Conquering mind-control devices and mental radiation, the heroes turn Brainiacs allies to their side and defeat him, banishing his intellect from his body, but at the cost of Draagas life. 1. Although numerous heroes appear on-panel with Lar Gand, only those who have had direct contact beyond this single story are tracked. 2. At the time of this story, Valor was still going by just the name Lar Gand, following his time with L.E.G.I.O.N. His actions in this story bring him to the attention of Eclipso in the 1992 summer annuals. 3. Actually, a clone of Lex Luthor posing as Luthors son. From Superman v2 #65: only 76-77:3 is dealt with here. Coloring errors: the tail to Guardians balloon, and the white parts of Ice and Elongated Mans costumes are pale blue rather than white. From The Adventures of Superman #488: only 84-85 and 103:2 are dealt with here. 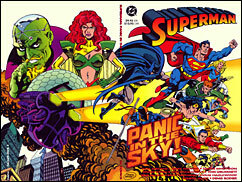 84-85 This follows right on the heels of the scene from Superman v2 #65. There are too many characters present in the scene in Superman v2 #65 to determine who the shadowed figures still inside the building on page 84 are. 92:2 This is where Dr. Fate suddenly appeared as part of the strikeforce. 103:2 As seen on page 108, Lar Gand is with this group, although he was never explicitly seen again in this entire issue after the opening spread. From Action Comics #675: only 108-110 and 128 are dealt with here. 108-109 Metamorpho (far left) was not seen as part of the strikeforce before this page. The yellow belts the characters are wearing are force-field belts with attached oxygen masks, as mentioned in 92:2. From Superman: The Man of Steel #10: only 132/133:3, 134:3-4, 136:1, and140:1 dealt with here. 134:4 It is an eternal weakness of Supermans, that he subconsciously limits himself in order to operate in a world not made to handle Kryptonian strength. And thus when he does come up against foes who are on a par with him  like Lar Gand  he has to struggle to break from such habits in order to fight back at a proper level. 136:1 That is Lar Gands fist hitting Superman. From Superman v2 #66: see completed Frunt analysis for that issue. From The Adventures of Superman #489: only 183:3-4 and 185:1 are dealt with here. 183:4 Left to right: Mercury, Lead, Platinum, Wonder Woman, Gold, Guy Gardner, Tin, Superman, Lightray, unidentifiable, Kilowog, Dr. Fate, Fire, Flash, two unidentifiables, Guardian, Lar Gand, Elongated Man, unidentifiable, Booster Gold, and Ice. 183:3-4 It isnt clear why Mr. Miracle, Kilowog, Lar Gand, and Booster Gold returned to Warworld following 174:3. Perhaps they didnt know the resolution and returned to make sure they werent still needed there. 184:2 Captain Marvel apparently didnt return to Warworld with the others, but stayed on Earth to coordinate things on that end.